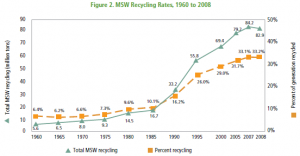 The most recycled waste is not glass, aluminum cans, plastic, or electronics, according to the EPA’s Municipal Solid Waste Report, last compiled with 2008 data, which I was referred to from a recent Scientific American article. It is car batteries, almost all of which are recycled. I actually have wondered what happens when they die, but I’m so glad to know that they ARE recycled. Just a nice tidbit of knowledge for you there. Recycling is more or less on the rise overall (see graph from the EPA report), thank goodness, despite the persistent folk out there who firmly believe that recycling has no net benefit and therefore don’t even try. Recycling is obviously on the minds of environmentally-conscious chemists (and other people, I hear other people exist) – but when you think of recycling and trying to green up your daily work life, what do you think of? Recyclable catalyst, acetone recycling, reading articles on your computer screen instead of on paper (including opting-out of C&EN’s print issues which, consequently, has decreased the degree to which I use it as a procrastination tool and the depth in which I read the non-science concentrates). But what do YOU do? I’m really curious to know. Do you just shrug and carry on? Guilt about the waste that we generate – and I can only attest to synthetic organic chemists and those who deal with tissue culture when it comes to the byproducts of science – is so, so heavy on my shoulders. I’m not a crunchy tree-hugger (despite being a vegetarian, yes), but I AM uncomfortable with generating a crapload of waste in order to obtain a few pieces of paper – a couple JACS articles, a Ph.D., etc. I know I’m not the only one that is frustrated to burn through so much physical material in the name of progress and intellectual/industrial pursuit. But what else can you and I do, besides cut down on our chromatography, not use disposable items, recycle our acetone and keep all of our data and journals electronic? How about big corporations? Are they making efforts at sustainability so that they can claim they are, or to actually conserve resources? Does it even matter? Take for example the new SunChips bag released by Frito-Lay/PepsiCo, the first compostable chip bag ever. It’s a start, no? For those with an interest in journalism and time this summer ACS is offering a summer internship in the C&EN newsroom. Deadline is Feb 22nd. Chemical & Engineering News, the weekly newsmagazine of the American Chemical Society, seeks an intern for our Science/Technology/Education department for the summer of 2010. C&EN reports current events in the chemical enterprise, including recent advances in research, education, industry, funding, and regulatory policy. C&EN reaches all 154,000 members of the ACS each week, and its online edition receives more than 13 million page views per year. The candidate should be a highly motivated student or recent graduate with demonstrated interest in science writing and at least a bachelor’s degree in chemistry or a related field. The intern will have a chance to write bylined news and feature stories for publication in C&EN. We offer a $1500 monthly stipend for three months. The intern ideally will be based in our Washington, DC, headquarters; however, exceptional candidates unable to relocate may be considered. Starting and ending dates are flexible. Contact Amanda Yarnell for more information about this year’s internship. Update: There is also an associate editor position available. My boss has pointed out this piece of news covered by C&EN. Apparently, starting from July, all ACS journals will be printed in a “rotated and condensed” format, that is two pages on one printed page in landscape format. This is an effort to reduce printing and distribution costs. In my opinion, this change is just one further step towards purely electronic journals that are not printed at all. I think this will deeply affect the way we present our data and how we look at formatting. Preparing a manuscript in a way meant for printing is different from one which will never appear in print. Some may welcome this change because it saves paper, others will probably miss the possibility of flicking through a new issue of JACS. Although I rarely go to the library to pick up a printed journal, I admit to reading printouts very often (see this post). Update: Apparently, in 2010 the print versions will stop completely, with the exception of JACS, Acc. Chem. Res. and Chem. Rev. See also Nature News. Recently, Chemical and Engineering News had to cut 16% of their staff due to decreasing ad revenue. [CS] Advertisers have been trending towards less spending, but this is often attributed to a lower subscription base. The number of C&EN’s subscribers do not fluctuate enough to account for this type of lost revenue, so what is causing the decrease? After the layoffs there are now 48 C&EN’s staffers. If I assume the average salary is ~$5,000 per month, I have no clue if this is valid but it seems like a lower limit dollar value, then C&EN needs to make $240,000 per month to just cover payroll. Our dues pay for their paper, printing, and distribution costs. So let’s compare C&EN’s revenue model to Chemistry Blog. First we need to define some terms. Uniques, defined as the number of unique people that read a website/magazine in a given week. With a weekly subscription volume of ~140,000, C&EN has a monthly unique volume of 560,000. Which means C&EN needs to make a minimum revenue per unique of $0.43 per month to cover my lower estimate of their payroll costs. On the other end of the spectrum, Chemistry Blog generated $15.00 in April from 20,000 uniques, this translates to ~$0.0008 of revenue per unique per month. The gist of this story is uniques are cheap online. We at Chemistry Blog fully admit that C&EN is a better news source, better journalism, and a better target audience for advertisers. But from a purely marketing angle, Chemistry Blog is cheap at a cost of one fifth of one percent for what C&EN sells their uniques. I would guesstimate $0.10-$0.20 of revenue per unique per month is a more sustainable model that a huge niche journalism outlet like C&EN will be force to aim for in 10-20 years. Unfortunately, this means many more painful cuts in C&EN’s future. Below are my suggestions to shore up C&EN balance sheets. Expand to non-ACS web advertising: C&EN already has a relationship with advertisers, if they initiated an affiliate program where independent chemical websites get a share of what advertisers are willing to pay for adspace. This expands the audience they can tell advertisers will see their ads. Many journalism outlets are scuttling their science sections. C&EN could sell their stories to these papers at a marked discount for what it costs to staff science journalists. Participate more strongly in ACS membership drives, more members equals more subscriptions which will hopefully be proportional to more ad revenue. Get a larger chunk of the budget subsidized from ACS. None of these ideas are going to be the savior of chemical journalism, but it might ease the coming pain.